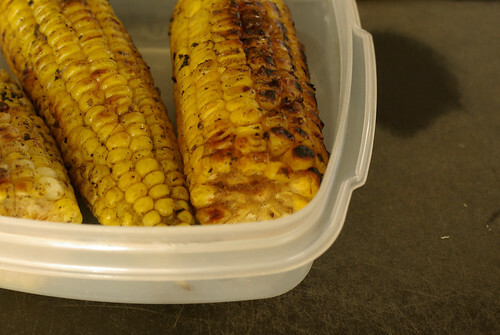 I had assumed that we would be eating all kinds of leftovers for days after our end-of-summer party. We did have huevos rancheros for breakfast (with drunken pinto beans and cotija cheese), and chips and guacamole for lunch, but then I realized there wasn’t really much else left except for a large pile of poblano and jalapeño chiles that somehow never got used, plus some leftover grilled corn. I really didn’t want to go to the store again, so I needed to think of something for dinner based on what was on hand. In a fit of fusiony madness, I came up with a sort of Tex-Mex risotto. I chopped two poblanos and sauteed them in salted butter (I should have added onions, which would have given even more sweetness and depth), then added Arborio rice, followed by a glassful of white wine. 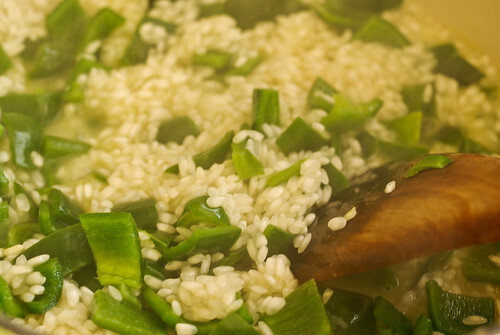 I brought a quart of garlic-scented chicken stock to a boil and began adding it to the rice. Near the end of the cooking time I took several pieces of cooked corn, cut the kernels off the cob and stirred them into the risotto, along with a pile of grated Parmesan. To top the risotto for dinner, I roughly chopped a few cloves of garlic and sauteed them in olive oil with a handful of peeled shrimp (which I quick-thawed under running water), and seasoned it with salt, cumin and paprika. 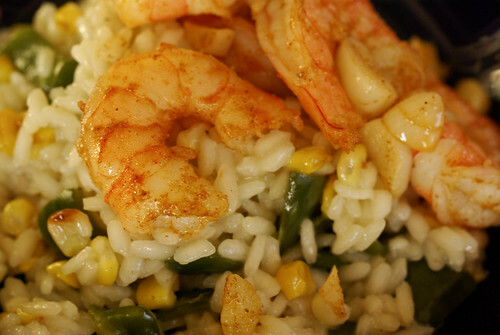 The garlicky shrimp juices were just what the risotto needed to perk it up. We drank a chardonnay-albariño blend that had a nice amount of both body and acidity. The leftover risotto was wonderful for lunch the next day, reheated in a nonstick pan until lightly browned. And no, I did NOT top it with a fried egg! I don’t always do that. This time I used a poached egg. Yum! That sounds and looks SO GOOD. I like the poached egg idea for leftovers the next day. Wow, I wish you lived in my head to tell me what to do with our leftovers!